If you’re a serious crafter, then chances are you’ve considered devoting a whole room to your passion. And if you’re looking for craft room ideas, then we’ve got a whole lot of inspiration for you right here. We’re passionate about craft room design — from storage, products and accessories to those little things that help to bring the whole room together. Here’s everything you should consider before creating your perfect craft room. Before you start raiding IKEA and Amazon for furniture, lighting and whatever else tickles your crafting pickle, it’s a good idea to envisage what your ideal craft room will look like when it’s finished. Now, of course, this is a highly personal process. What we love about our craft rooms will likely be different to what you want to see in yours. Some people love lots of white, open space, while some of you will prefer a room adorned with artwork and other trinkets to inspire you in your craft. Lots of light: whatever your craft, chances are you’ll need lots of light to be able to truly focus in on it. Ideally, that will be natural light, with large windows, but artificial lighting works well too — just make sure that you have enough of it! Lots of storage: storage will be one of your larger ticket purchases when it comes to craft room design. Whether that’s cabinets, drawers, shelves or whatever, just be prepared to get storing. Large workspace: another expense to contend with is ensuring that you have a large desk or table that you can actually craft on. The size you need will vary according to the type of crafting you do and how much space you take up. Inspiration: what inspires you in your crafting? Remember to make the room your own, perhaps with artwork, photography, painted walls, trinkets… whatever you can think of. The most important thing to keep in mind is to make your craft room a place where you want to spend time every single day. Think of it as a sanctuary just for you. That means you can design it exactly how you want to, paint it in the color scheme of your choice and just generally have it looking whatever way you want it to. We always recommend exploring sites like Pinterest and Instagram for inspiration before you start designing — we’ve compiled some of the most beautiful craft rooms at the end of this post — to give you some idea about what your finished craft room might look like. Obviously, if you’ve got a huge room and a large budget, you can essentially do whatever you want with your craft room design. But, let’s face it, most of us are working with limited space and a low budget. Never fear, however — these restrictions only inspire us to become even more creative with the resources we have. We’ve included some extra sections on small craft rooms ideas and craft room ideas on a budget too. It’s worth bearing in mind, however, that you can create an incredible craft room regardless of the amount of space or money you have to spend on it. You just need to be careful when buying to ensure that you’re getting the most efficient products for your space and budget. Now, enough with the consideration — let’s get down to what you might want to buy for your craft rooms. The major purchases are going to be in the first two sections: furniture and storage. Lighting is really important when it comes to decorating your craft room. Without it, you’re going to be squinting for sure. For the sake of your eyes, invest in some good lighting! Accessories are generally much smaller and can often be added later — they’re not what we would term essentials. We often include wall art and other little inspirational objects into this section. And although color scheme is last in our list, it should actually be one of the first things you consider. This way, you can paint the craft room before you start moving all your furniture in, and you can choose your purchases to fit the color of the room. There are two major pieces of furniture that you need: a workspace/desk and a chair. These are the craft room furniture essentials — anything else you can add later or as you see fit. Before you do anything, make sure that you measure the space you have available for a desk. This is likely going to be the largest object you buy for your craft room, so allow yourself as much room as possible. At the very least, you should have enough space for whatever machine you spend most of your time crafting with — whether that’s a sewing machine, vinyl cutter or printing press. Ideally, this desk will also have lots of storage space underneath it too — although if you’re on a budget, it’s often cheaper to simply buy a wide table instead. This is the craft table that we use and we can’t say enough good things about it — a huge work area and absolutely oodles of storage space. It’s also very reasonably priced considering its craftsmanship. This HEMNES desk from IKEA is also a great craft table. It’s a little more impressive looking than the South Shore desk above, and it would be well suited to crafters who use their computers during their crafting sessions, as you could easily mount it in the central shelf. It’s also bigger, with more concealed storage space. You might want to buy a craft table that’s specific to your actual craft. This is definitely a good idea if you’re committed to just one or two types of crafting. This gorgeously finished craft table is the perfect furniture and storage for sewers, embroiderers and quilters. It’s on wheels, so it’s more of a cart really — but it’s got plenty of storage space for your machine, and a large work area for your sewing. It’s important to choose a chair that you find comfortable and provides you with adequate support. We know that we’re not the only crafters that find ourselves hunched over, squinting at our creations late into the night, and then wonder why our necks are stiff the next day! Ideally, your crafting chair will encourage you to sit with an upright posture, in order to best protect your neck and spine. We’re going to show you our favorite chair, as well as some other ones you might want to consider. A chair is another personal purchase so remember to go for what’s right for you. This Modway chair is really the big daddy when it comes to office and craft room furniture. Although it’s specifically designed to be an office chair, we think it works fabulously for our crafting needs. Yes, it is expensive — but if you suffer with a bad back, you’ll probably consider it a price worth paying. We’d also encourage you to check out the wide selection of office chairs at IKEA. How you light your craft room will depend on its size and how much natural light it gets already. If you’ve got a lovely large south-facing window, it’s unlikely that you’ll need anything more than the lights you’ve already got installed, and maybe a desk lamp. For those of us that aren’t quite that lucky, however, we’d recommend invested in a standing light to enhance the lighting already in the room, and a desk lamp too for particularly close work. This desk lamp will come in very useful for crafts like sewing and embroidery. We tend to get all our lighting — and most things! — from Amazon but you also look in places like IKEA and specialist lighting shops for these products too. OK, so now you’ve got your craft room furniture and lighting, you’re probably wondering how you’re going to actually organize the room. Storage is everything in a craft room. We all know how many accessories we need to do what we love — plus, we need somewhere to put our creations once they’re made! You might have bought a desk or craft table like the ones above that come with plenty of storage. In which case, you probably won’t need too much extra — perhaps a couple of shelves and some storage boxes. To decide exactly what you need, it’s best to do an inventory of all the machines, accessories and materials you actually have and then buy storage to fit what you’ve already got. We honestly couldn’t live without this clear plastic organizer. It can store basically anything and because it’s clear, you can go straight to the correct drawer to retrieve whatever it is you want. We use ours to store thread, needles and ribbons for sewing, and we’re thinking of getting a second one to store all our materials and accessories for our die cutting creations too. We use this beautiful storage cabinet to store our machines and some of our larger creations too. It’s reasonably expensive, but is undeniably gorgeous to look at thanks to its ‘antiqued white’ finish. It’s very well made to boot. If you’re looking for small craft room ideas, this wall organizer should be on your list on things to check out. It hangs off the wall and provides a huge amount of extra storage for your tools and accessories. We actually started out with this in our shed to house our gardening tools, but quickly realized that it would come in handy in the craft room too. It’s super strong and is also scratch and rust resistant. Winning! Of course, there’s a whole world of opportunity when it comes to craft room organization. Although the three pieces above are the storage solutions that work for us, chances are you might be looking for something a little different. When it comes to finding things that inspire you to add to your craft room, the onus is on you: this is a highly personal decision. You should think about what inspires you to create in your day to day life: art? Gadgets? Trinkets and accessories? We generally think that the best way to buy inspirational objects is simply to acquire them as you come across them instead of going out looking for them. But, saying that, there are a huge number of online market places selling handmade, unique goods that might be calling out your name — you just need to find them. And don’t forget the little things! You know — stationery, wall clocks, pen holders, rugs, you name it. The color scheme that you decide to paint your craft room is another personal decision for you. Speaking very generally, the rooms that work best are light and airy — whites, creams and pastel colors are particularly popular. But if a deep red or an amethyst purple is more your style, then feel free to indulge that passion — perhaps consider balancing darker colors out with lighter accents around the room. If you’re looking for some color scheme inspiration, check out this article on the color palettes of 50 visually impactful websites. Yes, it’s designed to inspire websites, but there are some incredible combinations here that would look fantastic in a craft room too. You might be thinking that this is all very well, but what about when you’re severely space limited? When your craft room is really just a box room? Or maybe even just a closet? If you’re focusing on small craft room design, the number one weapon in your arsenal is undoubtedly storage. With some clever design and forward planning, you’ll be able to make as much use out of your room as a crafter with a much bigger space to work with. First off, take a look at some of those craft tables we recommended above. They really make the most of the space they take up, with a wide worktop and plenty of storage hidden underneath the table. Some desks actually having folding tables that can be used to extend the work area by a significant amount. This means that you have plenty of space to craft and then can fold the desk away neatly when you’re ready to store it. Another must-have are wall organizers. They can hold a huge number of tools, accessories and even machines and only take up wall space — perfect for the smallest spaces and closets. In the same vein, putting up a bit of DIY shelving is a good idea too. If you don’t have space on the floor, put it on the wall! Alternatively, you could buy a craft bag instead. You can store your machine, accessories and materials in these and tuck it away into a wardrobe or other storage when you’re not using it. Plus, a bag is obviously ultra portable too — good news for people who like to craft on the go or who travel to a lot of craft shows. Another challenge to consider when creating your dream craft room is your budget. Can you afford to be buying a large desk, plenty of storage and artwork? 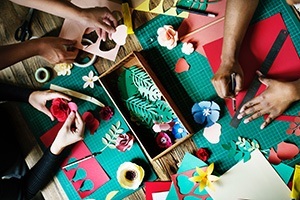 If not, or if you’re feeling like you want to start crafting already, you may want to consider a bit of DIY while you’re researching craft room ideas on a budget. Firstly, it’s time to assess what your budget actually is — and if you have one at all. If you do, decide what the ‘priority purchase’ is for your craft room. This will be the one thing that you’ll buy outright instead of making yourself. For us, it would be getting the biggest desk we could afford. The best desks have the most workspace and storage space so are efficient in a number of ways. However, if you’re skilled in woodcraft, you might be happy to whip up a table yourself, in which case your budget might go towards storage solutions, or painting the craft room itself. Go hunting — what do already have at home that you could use in your craft room? Any old pieces of furniture that could be refashioned? Embrace the vintage/rustic look — when you’re using a total hodge podge of different furniture, shelving and storage that you found around town, you’ve really got to embrace it. The vintage look is quirky and beautiful — don’t hide it! So, by now you should have a good idea of what you need to buy and design for own craft room. But if you’re looking for a little inspiration — whether that’s for craft room organization, color schemes or what-have-you — we’ve got you covered. Pinterest is an absolute treasure trove of craft room ideas, and we’ve picked out a few of our favorites that have influenced the way we designed our crafting sanctuary! Any questions? What does your craft room look like?